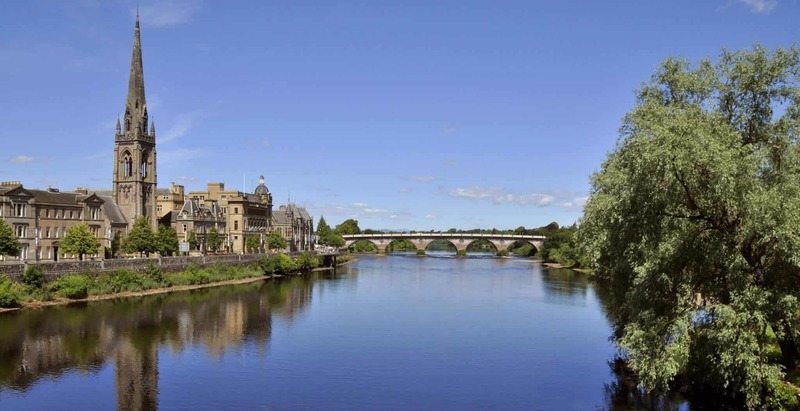 Once Scotland’s capital and much favoured by James I, The ‘Fair City’ of Perth, with its tall spires and River Tay flowing through it, is the town that inspired Sir Walter Scott to pen ‘The Fair Maid of Perth’ which in turn inspired Bizet’s opera. Modern Perth is situated 3km downstream (on the River Tay) of the original Roman fort of Bertha. Bertha/Perth is translated as “wood” from Cumbric and Pictish Gaelic languages and from Celtic as “Aber The”, meaning “mouth of the Tay”. It is interesting that even at the birth of this town, it was perhaps valued for the arboreal richness which is now one of the selling points of the county of Perthshire. “Big Tree Country” accommodates the world’s tallest hedge, Europe’s oldest tree, the Fortingall Yew (estimated at between 3000 and 5000 years old!) and the sole survivor of Shakespeare’s Birnam Wood (from Macbeth). Bertha was the limit of the Roman Empire in Britain; the Romans never defeated the Picts at Scone (pronounced Scoon), the ancient capital of Scotland, only two miles north of Perth. Scone Palace, immortalised in Macbeth, was the home of the Stone of Destiny, on which many Scottish Kings were crowned. In 1296, King Edward I of England invaded a virtually defenceless Perth (only a ditch acted as protection) and seized the Stone of Destiny, moving it to Westminster Abbey. In 1950 Scottish Nationalists returned the stone to Scotland; it was uncovered 4 months later in Arbroath. This story has been recreated as a film (starring Robert Carlyle and Billy Boyd amongst others); released in Canada this year and in the UK later this year. Officially handed back to the Scottish people in 1996, the stone now resides in Edinburgh Castle. Regeneration and resurrection of its people from dark times is a pattern of the development of Perth. The situation of the modern town lies 3km further downstream of the original site because silting of the River Tay forced settlement to follow the head of the tidewater downstream to maintain a connection with the sea. By 1125, silting had restricted the most navigable point on the Tay so that when King David I set up a new town it was at the site of modern Perth. The original street plan is still evident in the town centre today. By 1560, silting had been so severe that Perth residents were forced to release their identity as a port and adopt new trades to become goldsmiths, metal workers and experts in leather goods. The central location of Perth has always lent itself to a Scottish centre for trade and this heritage is reflected in today’s Perth. The market tradition is still going strong throughout the year. The monthly Farmer’s Market brings fresh, local produce direct to the consumer; the continental market adds a flavour of variety; and the art market and the craft markets provide the opportunity to sample local craftsmanship. The River has always been of significance in Perth’s story. As the lowest crossing point of the Tay, the city became a passing point for armies. In the Wars for Independence, Perth was held and heavily armed by the English until Robert the Bruce reclaimed it in 1313 by swimming across the moat and climbing the walls! The aggressive Battle of the Clans also took place in Perth in 1396, between Clan MacKintosh and Clan Kay. It had been attempted to settle the dispute amicably but to no avail, the feud was instead resolved in a bloody battle with 48 of the 60 participants killed. Allegedly, only one of the soldiers from Clan Kay survived and, seeing he was out-numbered, leapt into the Tay and swam to safety. In 1618, Perth was described by Taylor; “a fine town it is, but much decayed” (although it was pointed out that there was still a good inn!). The Tay, although beneficial to the growth and economy of Perth in many ways, has also been detrimental. Flooding in 1209 destroyed the bridge across the river and also damaged the earth motte on which the castle had been built in 1160 to the extent that the entire castle had to be brought down. Flooding has been part of the story of Perth, with three bridges succumbing to the power of the Tay at peak flow. The decay Taylor described could also refer to the repeated declines in population attributable to plague. In the 1350’s the Black Death struck Perth and decimated the population to the extent that only 370 properties were occupied within the defensive walls. Plague assaulted again in 1584-85 when 1427 people were lost. However, enough survived for the grammar school to still have 300 pupils… Until Cromwell and his forces demolished the building in 1652, replacing it with one of five citadels built to subdue Scotland! Even after Perth Royal Infirmary was built in 1814, the city remained unsanitary for decades and was hit again in the 1830’s, this time by a Cholera epidemic. However, the picture of Perth today is much more appealing! Explore Perth’s heritage with visits to Huntingtower Castle (with it’s “colourful” history; tales of treason and romance) or the striking St John’s Kirk. Aside from the bustling town itself, just a step out and you can be in some of the most picturesque countryside Britain can offer (Queen’s View near Pitlochry (north of Perth) is hailed as the most famous view in Scotland. The county is a botanist’s haven, with a history of botanical explorers residing from the region (celebrated at the Scottish Plant Hunter’s Garden, also in Pitlochry) and one of the most famous plant hunters, David Douglas, was born at Scone. Douglas introduced over 200 plants to Britain from his botanical exploration of north west America including the Douglas fir (Pseudotsuga menzieseii). The diversity of flora and fauna in this area of Scotland is breathtaking and not just for the experts, the colours and textures during all seasons dazzle and amaze! Perth is easily accessible by both road and rail, please try our UK Travel Guide for further information.